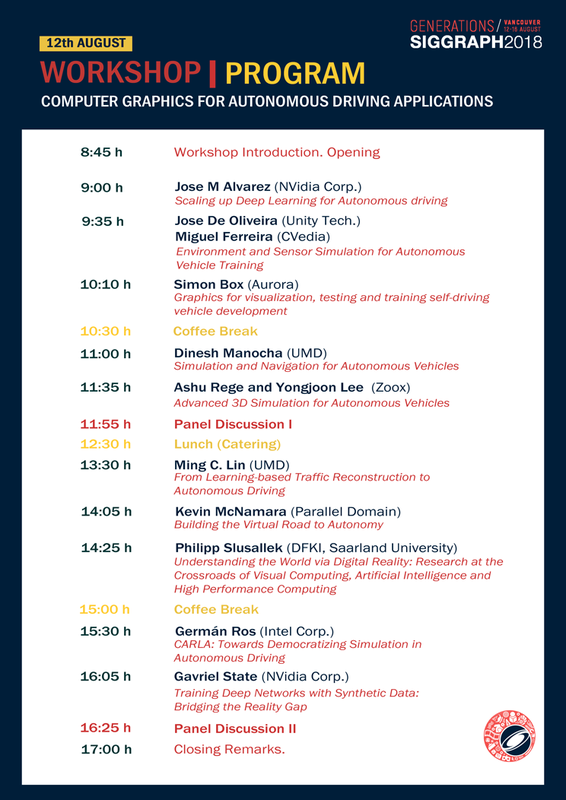 Last summer we organized an ACM SIGGRAPH Workshop on Computer Graphics for Autonomous Driving Applications. Looking forward for future events like this!. You can still check last year program. I have been invited to participate as expert evaluator in the Spanish State Research Agency (AEI). Great week at the AutoTech Summit and Unite Berlin 2018. Our on-going work has been featured at Unite. In April I taught CUDA for Deep Learning at the CVC/UAB as part of the Master in Computer Vision in Barcelona. I gratefully acknowledge the support of NVIDIA Corporation to my research through the GPU Grant Program.
" Hi, my name is José and I'm a researcher in Visual Computing and Computer Graphics. I recently joined the Computer Vision Center at the Universitat Autònoma de Barcelona. Before I was an Associate Researcher at Disney Research, based in Edinburgh (UK). In my previous life at Disney I've been a Marie Curie Postdoc researcher at the University of Zaragoza, working in the Graphics and Imaging Lab directed by Diego Gutierrez. Even before that, I was a researcher for more than 5 years at the Visual Computing Group at CRS4 (Italy) leaded by Enrico Gobbetti. Under his supervision I received my Ph.D. Degree in Electronic and Computer Engineering from the University of Cagliari (2011). My Ph.D. thesis is available here. In the beginning, I received a M.Sc. in Computer Science from the University of a Coruña (Spain, 2006) and worked in VideaLAB, a computer graphics lab in the School of Civil Engineering at the University of A Coruña. I have received three Marie Curie grants from the European Union and work for multiple EU and industrial projects in collaboration with multidisciplinary researchers of all around the globe. " " My main professional interest is to work and lead cutting-edge research and development activities related with computer graphics and advanced visualization techniques. I've work on cinematic lighting, real-time graphics and GPU-based rendering techniques. Recently I am exploring opportunities in other fields like Computer Vision, Autonomous Driving and Deep Learning. I've also a background on scientific visualization working mainly on multi-resolution and compression domain volume rendering techniques that exploit GPU hardware and compressed representations of volumetric datasets. My research also covered specialized rendering on light-field displays, GPU-accelerated segmentation algorithms or virtual humans and virtual reality to cite a few examples. Together with my colleagues, we have proposed out-of-core rendering techniques which have inspired further work by other research scientists, medical imaging companies or it has been integrated as part of larger systems to accelerate cinematic lighting pipelines in the movie industry. "